me: well, guess where i’m from. me: nope. guess once more. me: wrong. i’m from the philippines. we reached surabaya then i handed him idr 15,000 (was idr 11,000 in the taxi meter) for the fare and thanked him. 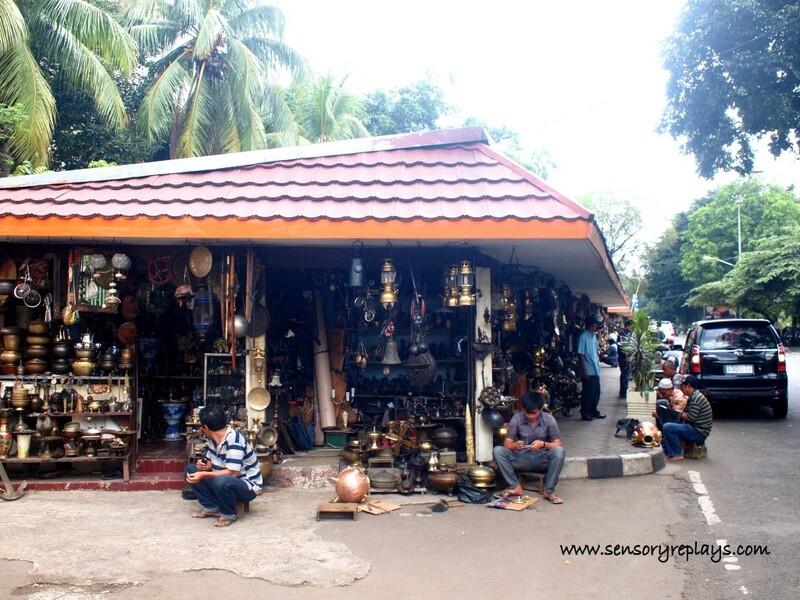 a few tourists were also looking for bargains as i walked beside the shops where the locals are seated at the curb either polishing brass or fixing items that they are selling. 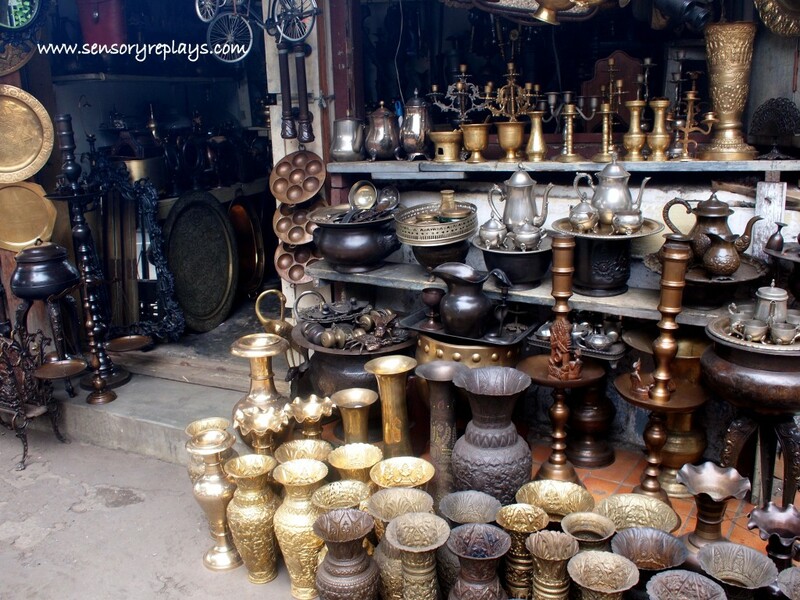 there were a lot of items being sold like these antique-looking brass items. my ma actually have a small collection of small brass vases but hers came from india. i am not sure if the stuff they sell are authentic, anyway i was only there to look and take pictures. 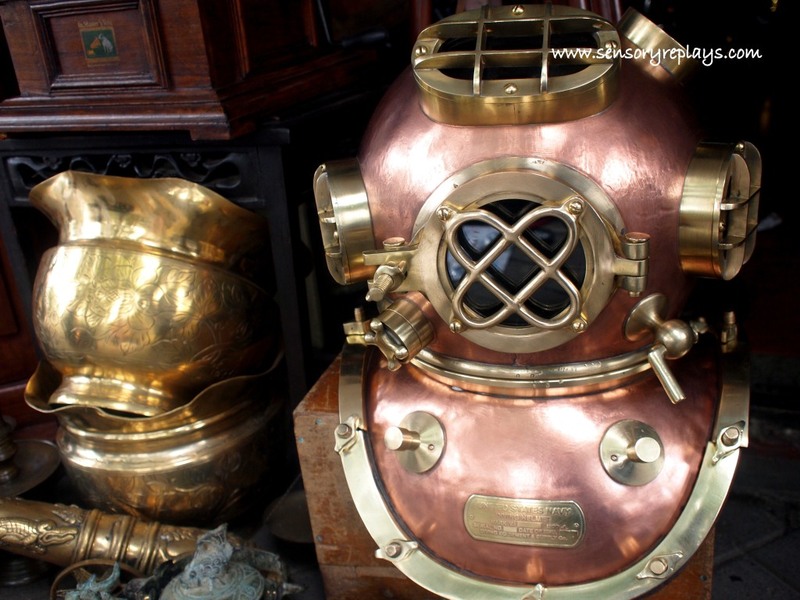 one caucasian woman actually bought one of these supposedly world war II diving helmet made of copper and brass material. then i passed by these wooden stick puppets which caught my attention. i was hooked. though i never had any plan to buy anything, these puppets are too artistically crafted that i wanted to bring one back home. 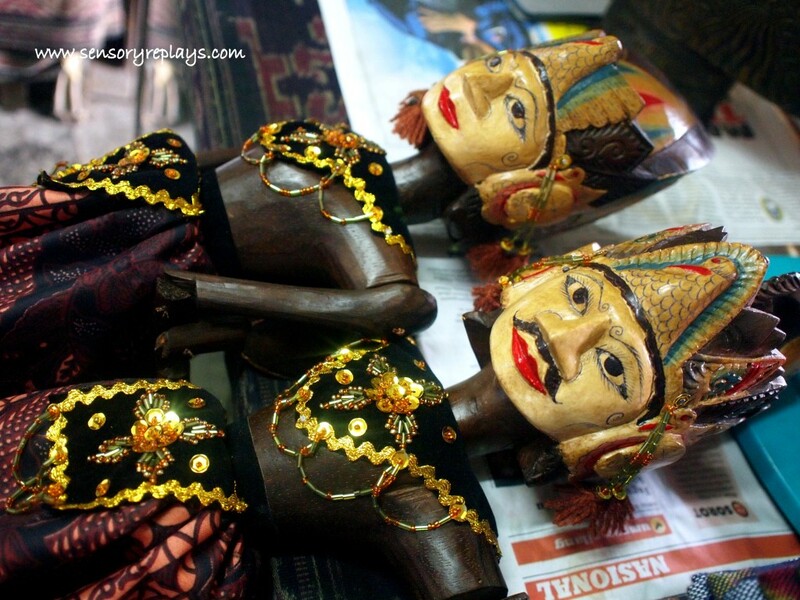 for idr 300,000 (about $30.00) i got these wooden stick puppets of rama and sita. i think it was worth it having one for myself. 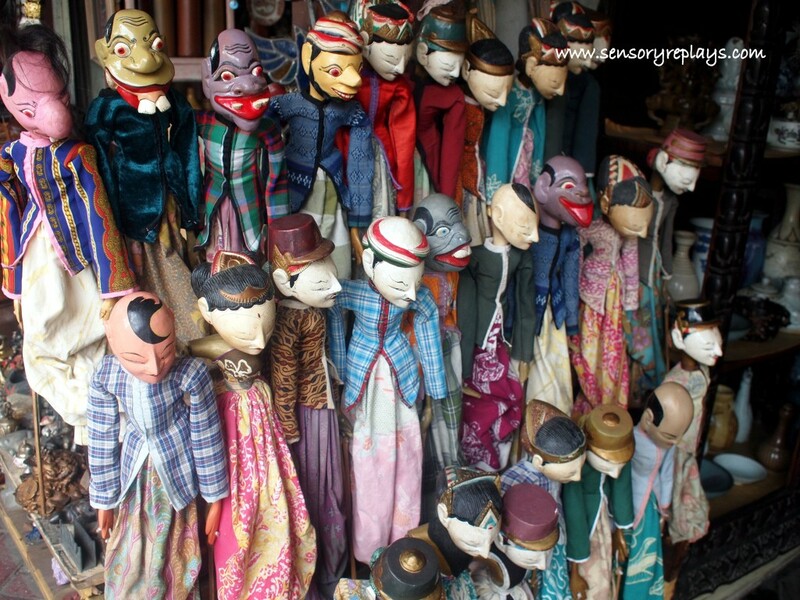 This entry was posted in been there and tagged central jakarta, christian bautista, indonesia, indonesia souvenirs, jakarta, jakarta souvenirs, jalan surabaya, lone travelling, rama and sita, rama and sita wooden stick puppets, solo travel, surabaya, surabaya street, wooden stick puppets. Bookmark the permalink. wow christian bautista is really an icon in indonesia! just wow! 🙂 i love those wooden stick puppets! .. hi pauline! thanks for dropping by. .. there’s another one, a pinay singer named maribeth. i love those puppets too, i’m glad i bought them. who is christian bautista? btw, you are a good tipper. i only tip generously when i am drunk, LOL. .. i tip pag di pure bu**sh** yung taxi driver, kahit saan naman kasi may bwakaw sa kanila e.
uy rob, wala ka talaga sa sirkulasyon sa showbiz, hahaha. sikat na sikat dyan si christian bautista, as in.. mas marami pa syang concerts and shows yata dyan na over na over ang mga tao kesa sa pinas e. napansin mo rin na may mga words na kapareho ng tagalog sa indonesian language? .. fan ka siguro ni christian keng? hehe. souvenir shopping is my kind of shopping. i like little knick knacks. yap, who is christian bautista? i believe i’m completely out of the showbiz loop. anjan pa ba si sharon? .. sinaksak ko lang yan sa bag ko pm. magkakaroon ka ng gift from me, abangan mo lang! .. i’ll post the link on my next entry, pramis! .. pressure!? 😀 goodluck on your project. 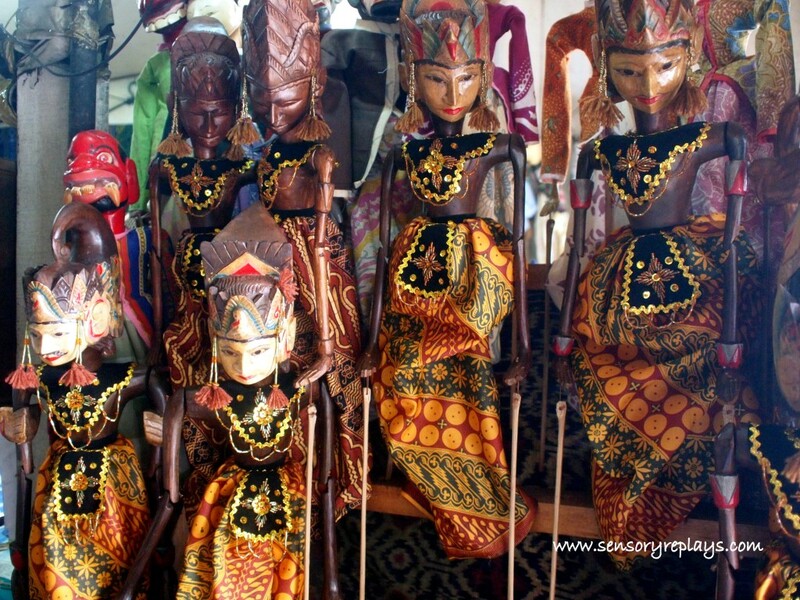 i regret not buying that java dolls, kaso ang mahal eh… besides, it’s still indonesia. trauma! .. meron akong nakita sa airport and they sell it as much as idr 400,000 per piece, pero syempre mas maganda. sa cambodia naman, marian at dingdong! the helmet looks too pretty to be authentic IMHO. and mygash di ba nakaka-highblood mag-convert? o ang lakas maka-yaman na nagbabayad ka ng 15000 for the fare? .. in demand siguro ang mga teleserye nila dun?! nakakalito ang pera nila, andaming zero! 15000 is like a dollar and fifty, hehe.